« BlogPaws Nose-to-Nose Awards — I’m a Finalist! I know how important hydration is for us kitties and how hard it is for some of us to drink enough water. We don’t have a problem at my house because we get most of our moisture from our raw food, but clean, fresh water is still so important. Getting kitties to drink is especially important for kitties who eat dry food. 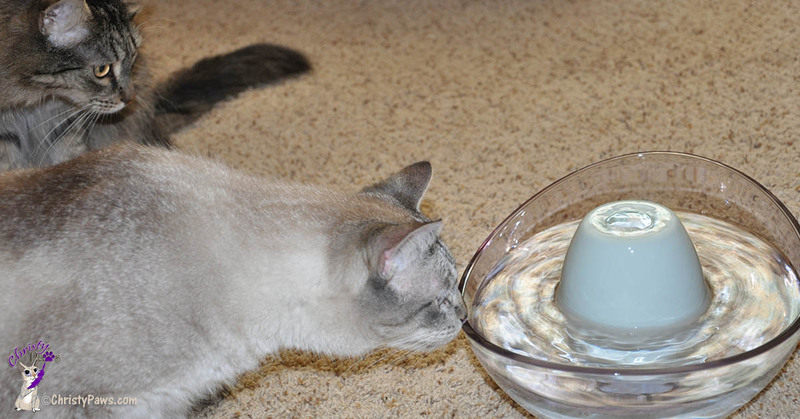 I wrote a post about hydration last year with ways you can help your kitties drink more water. A water fountain is just one of the ways. Lots of my furiends had giveaways for water fountains last year but I never won. But, guess what! 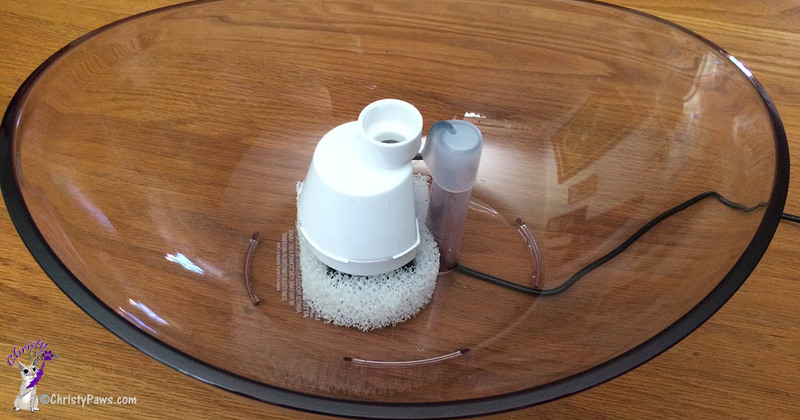 A few weeks ago, I won a PetSafe Sedona Pet Fountain from my furiends Truffle and Brulee at Sweet Purrfections. It took mom a while to get her act together and get it put together. It took her even longer to help me write this post, but, finally, here it is. 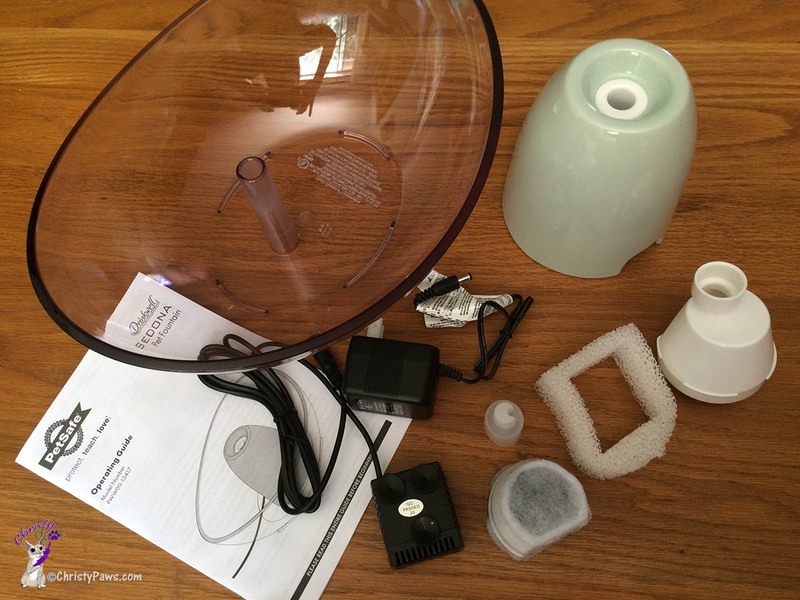 When mom opened up the water fountain box and saw that it had quite a few parts and the instruction booklet was many pages long, she set it aside saying she was too busy to deal with it. Tell your moms not to let that dissuade them. Once mom started actually putting it together, she found out it was really very quick and easy. The instruction booklet has so many pages because it is so thorough and easy to understand. Of course, I supervised this process. Once the fountain was put together, mom invited my brofurs, Echo and Ocean, to come check it out too. Well, even though the water fountain is whisper quiet, we just really weren’t too sure about it. This is pretty common, furiends. You know how suspicious we can be and how we don’t like change! Just give your kitties some time to adjust. You might need to put their regular water bowl near it for a while. 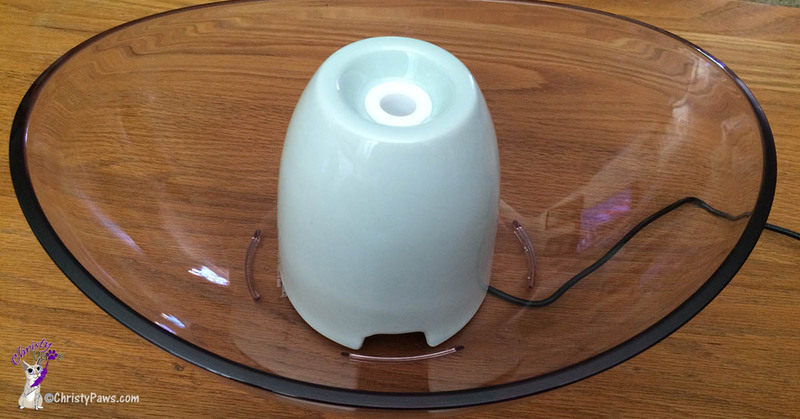 Mom really likes this fountain because it is quiet and the clear bowl is unobtrusive no matter where it is located. She also liked that it was so easy to put together and the instructions were so clear. As convenient as water fountains are for your humans, remind them to refresh your water every few days and to thoroughly clean the fountain about once a week. The carbon filter needs to be replaced every 2-4 weeks and the foam filter every one to two months. PetSafe offers a filter subscription that will help your human remember to do this. Also, the pump needs to be taken apart and thoroughly cleaned every two weeks. So, a water fountain does require more care than a bowl of water but mom thinks it is worth it. Do you have a water fountain? If so, did it take you a while to adjust to it? P.S. I was not compensated for this post in any way. I am just reviewing the fountain I won. Tagged blogpaws, cat, Christy, Echo, hydration, Ocean, raw food, water fountain. Bookmark the permalink. What a nice water fountain! I bought a cheap water fountain a couple of months ago. It didn’t take me awhile to set up but I do find myself cleaning at least once a week due to hair, dirt and debris in the water bowl. Congrats for winning it as a prize! Your post is very great. I’ll buy a fountain for my cat. She’ll love it. Thanks for sharing! What a great idea! I will do another for my cat. Thank you for sharing with us. Ít’s so useful. This fountain was a great prize Christie! We don’t have a water fountain, but i’m sure my cat would love it. He likes to drink running water, so this would be perfect for him. I must get him one! I’m so glad you got your paws on a fountain! They’re great! They really do help to encourage more drinking, which is super important for kitties! Great photos! That is both stylish and functional. Love it! I need a portable one of these for Piper. She refuses to drink water when we are out and about even on really hot days. Love the water fountain. it looks great! That sure looks like a great fountain and no doubt there are lots of benefits. I was just reading on Fidose of Reality that fluoride in tap water can be bad for dogs. I think Kilo would like it too. My daughter got a water fountain for her kitties a few years ago, and they LOVE it!! They often hop into the bathtub and beg for the faucet to be turned on, so they obviously love running water! I don’t recall that it took them any time to adjust to it at all. SInce pets need an ounce of water per body pound per day, this is a timely post for many. Cats I know can be tough to get to drink sometimes. This looks great. We want one of these they look elegant and really stylish. Oh and we like fountains too! That fountain is so pretty I want it in my house! I am not sure how the pups would feel about but it would look super nice! That is a very pretty water fountain. I have read that cats in particular are fussy about water and fountains are great way to make sure they stay hydrated. Mr. N doesn’t drink much water so I wonder if a fountain will help with that. Back when I had cats, I had a fountain. They totally adored it! Brulee really prefers this fountain over the Pagoda that Truffle likes. We’re glad you like the fountain. We’ve drunk from them since we were kittens. Last night’s Twitter chat really opened my eyes to how much water my pets really need. I think I will be investing in one of these! Great post! Dat looks really cool. 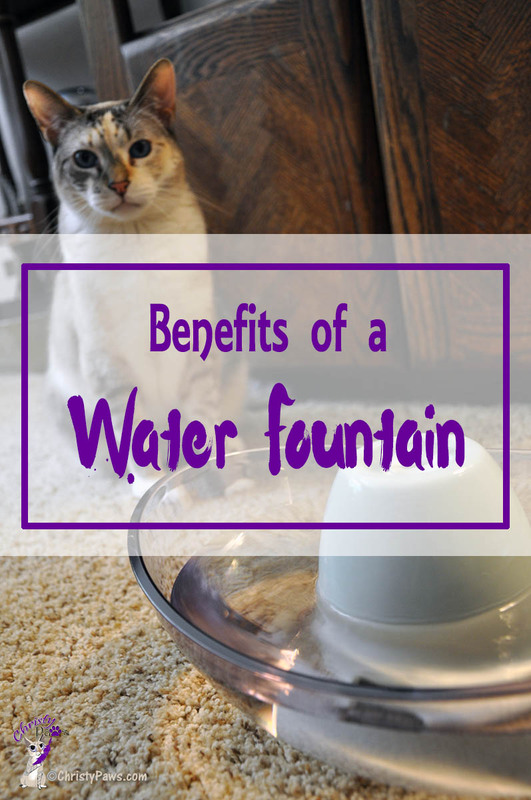 We luv our fountains and couldn’t ‘magine goin’ back to a bowl of water on a regular basis. Me’s favorite fountains are da ones dat have streams and such. Da Petsafe fountains are really easy to clean, but so is da Catit. Mommy wishes da catit came in somethin’ other than plastic, but since me drinks from streams me never touches da plastic at all. MOL Anyways, glad ya’ll like your fountain. That looks like a really nice fountain. 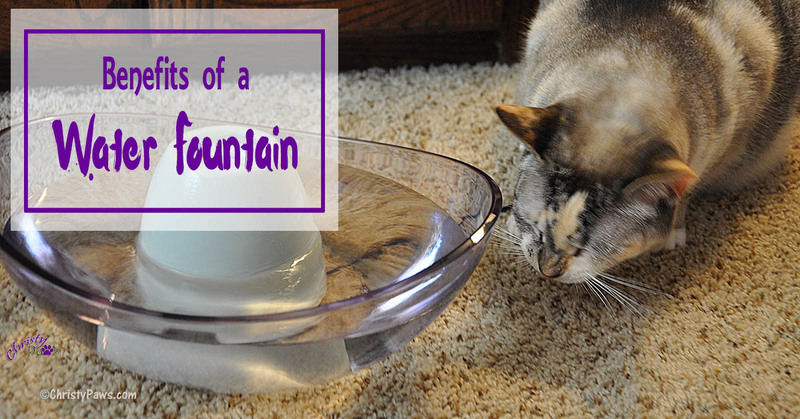 It’s not splashy – none of my kitties have wanted to drink from a splashy fountain. It also looks like it’s easy to clean. It looks like a great water fountain. I need to get one of these. It seems like forever since mes stopped by your blog. When wes quit blogging for a while we was not sure about starting again, so we was “below the radar”. We also lost alot of our furrends links when wes deleted my blog! Mes so furry happy that wes can visits again! Wes used to has a fountain, wes loved it, but our Daddy is a plumber and he was concerned about the pumps in most of the fountains and how difficult it is to clean the bacteria out, so we quit and went back to bowls. Wes LOVES our water, so its never been much of a issue. We have a water fountain too, but yours is way prettier! That is a super nice fountain. We have a couple of ceramic ones and they are pretty darn popular! That is a nice water fountain. I want to get my cats another one someday, but I will get stainless because I seem to break everything.